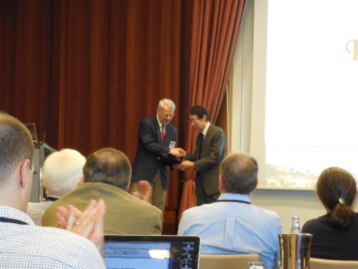 The conference opened on the 8th with the presentation by Dr. Weigel of a token of honor and appreciation to Dr. Koji Kimata of Aichi Medical University, Japan, to whom the conference was dedicated for his long years of international contributions to hyaluronan (HA) research. This was followed by an introduction by Dr. Vincent C. Hascall (Cleveland Clinic, USA) to Dr. Kimatas work including the finding of Serum-derived Hyaluronan-Associated Proteins (SHAP). Participants enjoyed viewing photographs of the young, earnest Dr. Kimata at work along with many of his colleagues who are now well-known in the HA and proteoglycan fields. Dr. Kimatas continual pioneering work was also apparent in his presentation on stem cell transplantation in Session 3. In the first session, chaired by Dr. Paul W. Noble of the Cedars-Sinai Medical Center, USA, recent news and future perspectives of HA research were discussed. Invited speakers Dr. Noble, Dr. Hascall, and Dr. Zimmer (University of Virginia, USA) spoke on the role of HA via TLR4 in regulation of alveolar stem cell renewal, the mechanism by which heparin prevents intercellular HA synthesis in hyperglycemic dividing cells, and lessons from cellulose biosynthesis for the mechanism of a processive glycosyltransferase, respectively. This session highlighted the exciting developments we can look forward to in HA functions as well as the elucidation of HA biosynthesis. Session 1 was followed by nine other wonderful sessions, details of which may be found on the conference web site. Relationships between diseases (insulitis, airway disease, atherosclerosis, and so on) including cancer in various tissues and HA were investigated by controlling expression of enzymes involving HA metabolism or hyaladherins, and the participation of various factors was newly demonstrated. Studies on the formation, structures and functions of HA-hyaladherin complexes were presented. Among them was a study on the nanomedicine targeting of HA-CD44 interactions aiming at cancer therapy. In addition to the relationships among the cell signaling processes involved with HASs and diseases, the effects of expression levels and posttranslational modifications of HASs, the behaviors of sugar nucleotides as substrates of HA biosynthesis and those of their metabolizing enzymes, and associations between them and cancer malignancy were discussed. Topics such as experiments using unique materials, i.e. the cells or HAS gene derived from naked mole rat to investigate relationships between high molecular weight HA, longevity, and cancer resistance were also discussed. In this conference, KIAA1199 (a novel HA binding protein playing a key role in HA degradation in normal human skin fibroblasts) was designated as HYBID (HYaluronan Binding protein Involved in hyaluronan Depolymerization). Regulation mechanisms of HA degradation by HYBID and the relationships between them and skin health were demonstrated, and furthermore, relationships between them and inflammatory bowel disease (Crohns disease) were suggested. Investigations of the involvement of HA in inflammations, fibrotic repair, or epileptic seizures using knockout systems of Has/HAS genes were also presented. A positive correlation between the activities of HASs or HA production level and the shedding level of HA-coated extracellular vesicles, as shown clearly by the confocal movies, as well as many other interesting new findings, were presented one after another. 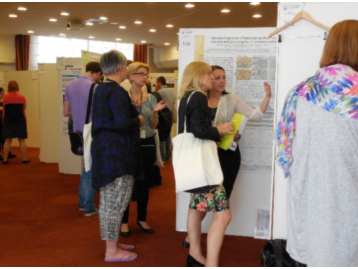 In addition to the oral presentations, two fruitful 2-hour poster sessions were held. Posters for all presenters, including invited speakers, were displayed with ample space enabling active discussion by several participants at once. The study of HA ranges over a wide and disparate field. Each of the posters was stimulating and enlivening, and provided many hints for our work, from doing experiments to analyzing data, as well as inspiration from the conclusions reached by those working in other areas of specialty. The spirited discussions continued until 7 every evening but the days in Florence are long and there was plenty of time left to enjoy reflecting on the days events over the evening meal. On June 9 afternoon participants enjoyed an excursion to the Uffizi Gallery Museum (Galleria Degli Uffizi) in the city center with a guide for each small group. On the way, we saw such famous sights as Brunelleschis great dome at Florences main cathedral, the Basilica di Santa Maria del Fiore, the Palazzo Vecchio in the Piazza della Signoria, and the many statues in the nearby Loggia dei Lanzi. This time the recipient of the Rooster Prize, which goes to those who have made a significant contribution to the therapeutic use of HA, was one of our young researchers, Dr. Gregory I. Frost (Intrexon Corp. USA), who has specialized in studies aiming at clinical application of hyaluronidase. He gave a presentation in Session 8 entitled Adjunctive and therapeutic applications of hyaluronidase: what have we learned since Duran-Reynals spreading factor? and is expected to do great things in future. 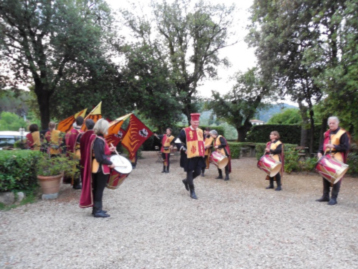 On June 10th a banquet was held at the Villa Viviani Restaurant located on a hill about one hour away from the conference venue. Upon entering the gate we were greeted by musicians in traditional costume, which was a bit embarrassing but conveyed to us the warm heart of the conference organizers. Drinks and hors doeuvres were partaken in the garden and we were left with memories of our happy chatting against the backdrop of the lovely Florence sunset. This was followed by a delicious Toscana dinner in the historical interior filled with gorgeous decorations while being entertained by music and dancing. Returning to the garden for desert and more lively conversation, participants were reluctant to finally board the buses to go back to the hotel. This conference is the only one in the world which brings together specialists from a variety of fields who are all doing work involving just one molecule, HA. Their studies extend from the basics of structure and metabolism of HA, and interaction of HA with other molecules, to cell function, the relationships with various diseases, and possible clinical applications based on physical properties and pharmacological functions of HA. Without regard to position or rank, both serious and humorous discussions were enjoyed by our most senior pioneering colleagues as well as current students as we all focused on that molecule we love most, HA. I have been fortunate to participate and learn at five HA conferences, starting in Cleveland in 2003, and always look forward to the next one. At Florence, I especially appreciated that specialists, not only from the glycoscience field but also biophysics and enzyme chemistry, etc. participated, bringing rich new eye-opening ideas to us. This outside influence so to speak, should really stimulate and speed up the studies of HA and the mysteries surrounding the involvement of HA in various events. The Florence conference received sponsorships from 15 foundations and enterprises. It would be impossible to continue these conferences without such generous assistance as well as the ongoing efforts of HA researchers to fulfill the mission of ISHAS. Before we knew it, the successful conference came to an end with Dr. Passis closing remarks. The next HA conference will be organized by Dr. Carol de la Motte of the Cleveland Clinic and held in Cleveland, Ohio, USA on June 11-15, 2017. At the closing of the conference even a participant with whom I have never had an opportunity to converse, extended her hand with a hearty See you two years from now! I am very grateful to have been able to attend HA 2015 at Florence and am greatly looking forward to learning more about HA in Cleveland. See you there! Dr. Weigel honors Dr. kimata for his contributions. One of the poster presentations. Being welcome to the banquet at the Villa Viviani. 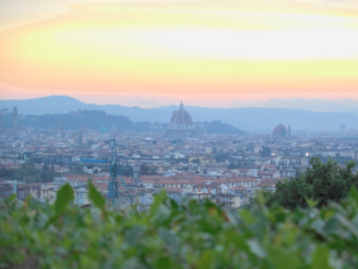 The View of Florence from the Villa Viviani.The dome seen in center is the Basilica di Santa Maria del Fiore.